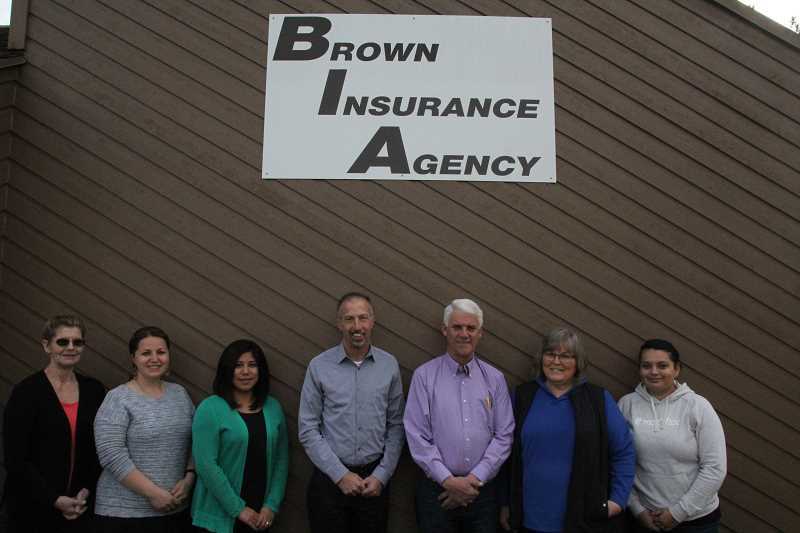 Brown Insurance is celebrating 55 years in business in Woodburn, and owner Carl Brown is celebrating 43 years with the company. On Jan. 1, 1963, Dan and Margaret (Peggy) Brown purchased the E.B. Jensen Insurance Agency in Woodburn. With three years prior experience in the insurance industry, as an agent for two large agricultural insurance companies, and coming from a farming background, they wanted to own their own insurance agency, Carl Brown said about his parents. After two years, they had added staff to the agency. In 1968, the Browns purchased property across from their home, which had been housing the business, to open an office to allow for more growth and staffing. Finding that office to be inadequate, they sold the family home, which was moved to a new location, and built another building on that site, where the office remains today, at 979 Young St. In 1975, Carl Brown joined the family firm. Coming from a sales background with Lee's Men's Shop, and having familiarity with the insurance terminology, he set out to continue to grow the agency, with the same business philosophy that his parents had: quality insurance products through quality insurance carriers and with service after the sale as a priority. He was promoted to president of the agency in 1991, and remains in that position today. Carl earned his Certified Insurance Counselors designation in 1997. Carl Brown has been active in the community, being first a member of the Woodburn Jaycees and a Kiwanis Club member since 1975 — first Woodburn Kiwanis, then switching to French Prairie Kiwanis in 2004. He was named Junior First Citizen in 1984. Brown Insurance today is the largest, family owned, independent agency in Woodburn, having five licensed agents and three support staff. They provide a wide array of coverage opportunities to their clients with the intent to find the right coverage at the right price and continue to provide the best service possible after the sale. "I can't be happier than being able to provide the correct policy for each individual client, and my real joy comes in helping our clients at their time of need," Carl Brown said. "Selling new policies is great, but doing that sometimes comes secondary to service to our current clientele. The agency is now licensed in Oregon, Washington and Arizona and has clients throughout Oregon, some of which have been with the agency since shortly after it was started." This month they celebrate 55 years in business, with 43 years in the agency for Carl Brown, who said he doesn't have plans to retire just yet. Next month, the company will celebrate 55 years working with Mutual of Enumclaw, the main insurance company Brown works with. Mutual of Enumclaw has named Brown Insurance to its advisory council this year. To be named to the advisory council means that that agency has been named one of 15 top agents of nearly 400 that work with Mutual of Enumclaw. "With that, we get to meet with the executive committee of the company every year to talk about changes and represent all the agents," Carl Brown said. "We've been on the advisory council every year but one since 2005 (as far as records go back)."